If you run a small business in a local community, consider buying keyword rich URLs for uncompetitive online spaces. Example: A laundrette recently set up in a prominent location on the high street in my town. For years there has been no such service and I searched keywords related to a self service local laundrette but nothing ever showed up in the web results. I spoke to this business recently on the phone and although they currently have no website (and no Google Plus Local either!) I recommended they seriously consider purchasing a URL containing geographic keywords related to the services they offer. They have an opportunity to position their business online for a set of keywords where there are no decent search results. The keyword suggestions that populate the search box demonstrate what other people have already queried in Google. 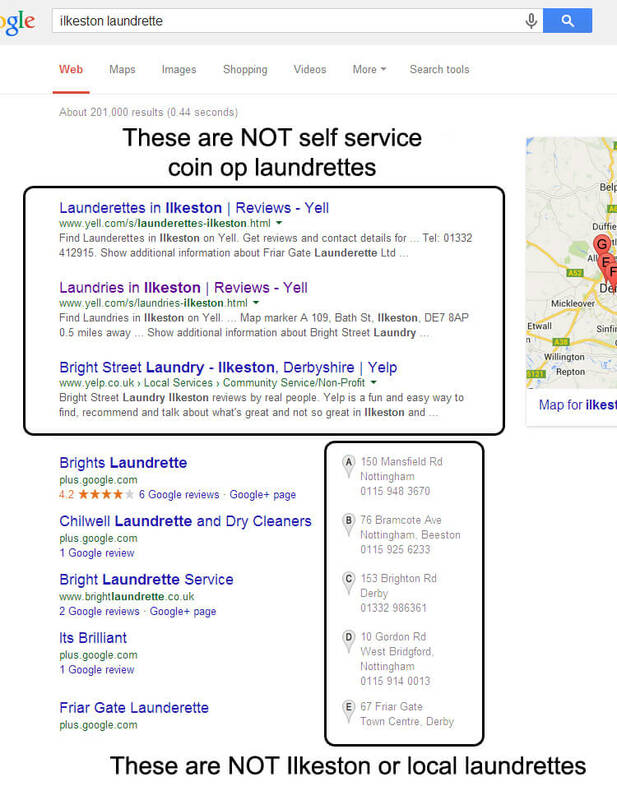 The problem is that when you actually search for “ilkeston laundrette”, the search engine results pages (SERPs) are very poor. The results that show up are not coin operated self service laundrettes in the typical sense. These results are ironing services or laundries where you have to drop off and collect your clothes. Also, the Google Plus Local results returned are not particularly “local”. What this means is there is a gap in the market for a local service to come along and dominate the SERPs. There is no competition. You can see clearly in the example above, the map results are returning Laundrette services from further away. 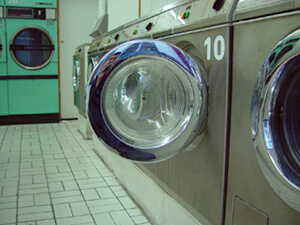 A local person will not want to have to travel several miles just to wash their clothing or other items. It is a good idea to buy up similar URLs which are keyword optimised for the local area. 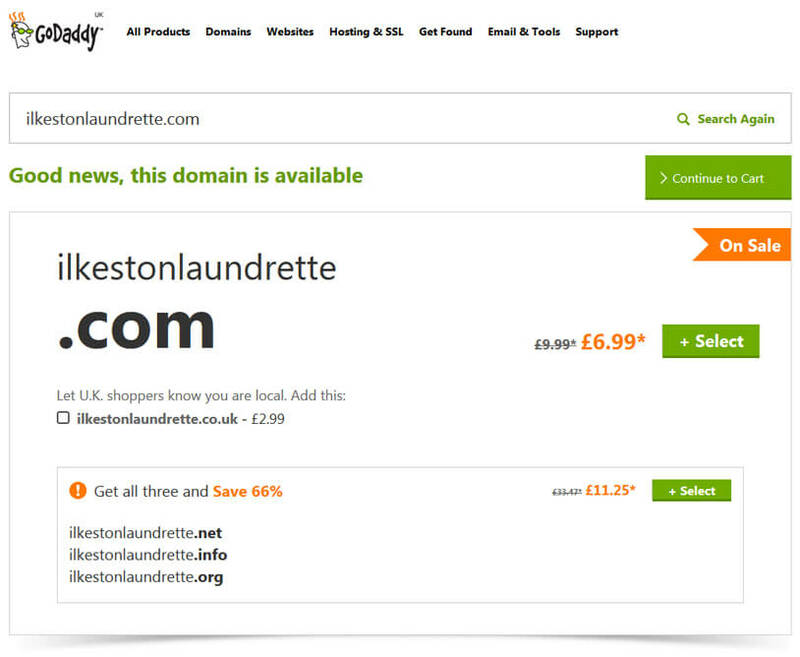 What if a competing self service laundrette comes along and buys the URL instead? Don’t go crazy though, you’ll just waste money. Buy one or two URLs and hang on to them if you know you can build something good and useful on them. Get the .com and .co.uk as a starting point. That should be enough. It is a good idea to stake out your digital territory by getting these website addresses and holding on to them. You can have them all redirect to the same website, or set up several “funnels” by creating entirely seperate websites. In the end, the business generated from these marketing funnels could be making money for the same local business. You would advertise the same address on each website. You can only have one Google Plus Local map listing. Connect this to your “main” site. Knowing the demand is high for this service in my town, and knowing there is no suitable website, I could build a niche website around this URL, market it, promote it, get it ranked and then “rent” the website to this laundrette for a nominal fee. Perhaps I could widen the geographic area to say, Derby, and actually create a directory of local self service laundrettes. I recommend they do this, and if they are reading this post, this is a reminder of what you should do; buy and keep the best business URLs. A few years ago, the web development company for the George W. Bush administration accidentally let the domain “GeorgeWBushLibrary.com” expire in a fleeting moment – or maybe hours/days – of disorganisation. The domain belonged to the George W Bush Foundation and was an archive of millions of pages of official text records documenting his two-term administration. When the domain expired, it meant it was up for the highest bid, to anyone. A “domain squatter” snatched the opportunity and purchased the domain GeorgeWBushLibrary.com for less than $10! Talk about the jackpot! After realising their error, Yuma, the web company working for the GWB administration, bought the domain back from the “squatter” for $35,000. It makes me wonder what other domains can be bought up in a manner similar to this. I don’t mean waiting for an organisation to make a mistake that can be exploited. That’s unlikely to happen again given the famous incident mentioned above. There is always something that hasn’t yet had its own suitable domain purchased, but you must be careful not to encroach on an established brand. They can take legal action on marketers who claim the intellectual property of others. For example, Apple and WordPress do not like third parties using their brand name as part of a URL. Though this approach requires much foresight you could always keep things simple by just being as sharp as a thistle when it comes to snagging opportunities by spying a gap in the market. A few years ago I purchased a URL pertaining to local fast food menus and built a website around this niche. Today the traffic stats have recorded 200,000 page views over the last 12 months. Although the common URL is .com (now modern vernacular) it doesn’t ALWAYS have to be a .com that you purchase. A .net or .info might be the only thing that is available. If you know your stuff when it comes to subject X, you might be able to ride the wave of the next big thing before it breaks and charge a handsome price. 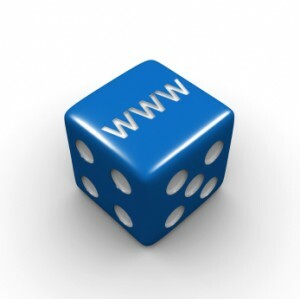 It’d be like playing an internet domain stock market, where risk is diminished considerably. It is relatively cheap to “squat” on URLS and certainly has the potential for a great return. Two popular URL registrars to get started if you have an idea of what URL you want to buy.